One of the rarest coins of the series, 1872 Indian head penny value is over $90. This minimum value quickly doubles for coins in nice condition. Most 1872 pennies are very worn with the date and portrait just visible. Rarely found are coins with any amount of detail remaining. The fact so few survive today in nice condition plus demand from collectors raises the value of top quality coins into the hundreds of dollars. You have a coin with lots of potential for value. With a quick look, can you recognize a ribbon over the hair curls along here neck? If showing, this is part of the design that indicates a better quality coin with higher value. Pictured is an 1872 Indian penny in "uncirculated" condition, absolutely no wear to the coin. These trade in the collectors market well above $543. 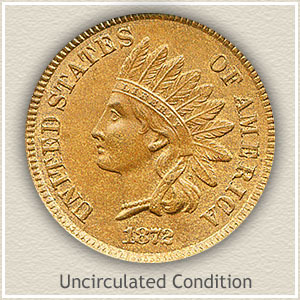 Indian pennies set aside long ago and resting in collections since are avidly sought by collectors and dealers. Outstanding quality examples often come from these sets. One such coin is highlighted in detail below. 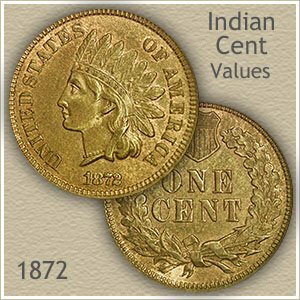 The gem condition and current 1872 Indian head penny value is remarkable. Obviously placed in a specialist collection of Indian pennies long ago this coin glows with original color and luster. A well preserved rarity and now a treasure from the past. One of only a handful surviving in such high quality. A remarkable coin for both eye appeal and mark free surfaces. 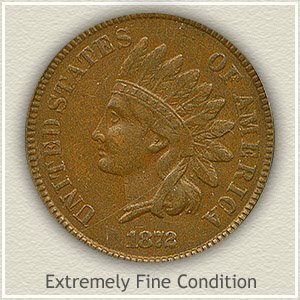 David Lawrence rare coin auctions offered this coin and by reaching $1429 when sold, confirmed steady demand and strong 1872 Indian head penny value. Many factors contribute to the value of your old coins, popularity of the series, the rarity of the date and the subtle details of its condition. All of these are present in this 1872 penny. The key to finding accurate value is judging your coin’s condition. Any 1872 penny is scarce and judging its condition accurately finds the higher value rare condition coins. Take a close, carefully examine your coin and compare it to the following images and descriptions. They visualize the important distinctions from one "grade" of condition to the next. 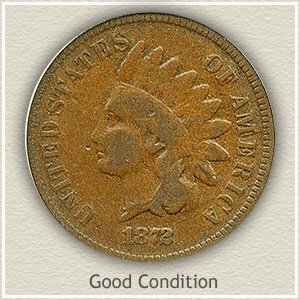 Uncirculated: For a coin to grade "uncirculated" and at the top of 1872 Indian head penny value no wear is present to its surfaces. Close examination is made to the ends of the feathers, hair and headband above her eyebrow and cheek and neck. These areas are the highest parts of the design and in the case of the neck and cheek, quickly show any wear. You are looking for a slight flattening to the normal roundness of the designs. Rotate the coin at an angle to you eye. Wear appears as a different color in the metal, compared to the surrounding non abraded surface. Fine: Separation of the major design elements are visible on 1872 Indian pennies in "fine" condition. The worn surfaces are evident but a roundness defines the forehead from the eye and cheek. In the area close to the headband the quill and inner parts of the feathers are beginning to show details. Only the high profile ends of the feathers are worn lacking any design. Hair curls are recognizable behind the neck. These moderately worn 1872 pennies are highly collectible. Good: 1872 pennies in "good" condition are collectible and worth a nice premium. Although worn to almost an outline, her portrait still shows slight detail. The lettering and date along the rim is clearly visible but in shallow profile. If your coin has avoided any serious dents and nicks and is not any worse than just described, it is considered solid for the grade. 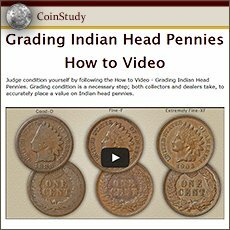 A very popular coin, everyone understands and has heard of the value of an Indian Head penny. Common dates are now worth more than one dollar each. Many collectors are building collections and putting a heavy demand on not only your 1872 penny but also the very rare dates and better condition coins. 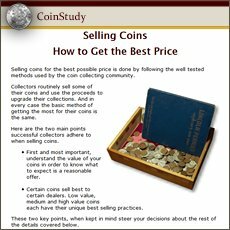 Compare your coins to the values chart.